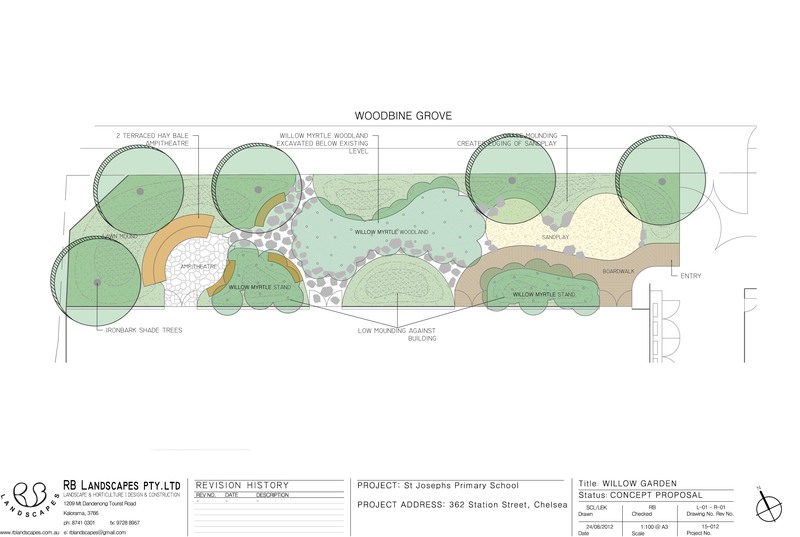 RB Landscapes has designed an landscape Master Plan for St Patrick’s Catholic Parish School in Mentone. The Master Plan includes a Outdoor Kitchen, Permaculture Orchard, Veggie Patch, Undercover Bike Storage, Tree House Adventure Playground, Amphitheatre and Passive Recreation Spaces. 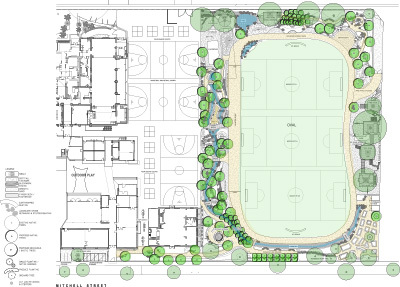 The existing oval will be re-graded and a 240m granitic sand running track, with 50m sprint included around its perimeter. The existing 2 Basketball courts will be reorientated to fit a third court along with down ball courts and hopscotch. The outdoor kitchen precinct to the east of the O’Hanlon Centre creates a unique learning and entertainment space. A central table with tree at its centre forms the heart of the kitchen. The bench surrounding the classroom to the south contains a sink, BBQ and Wood Fired Oven. 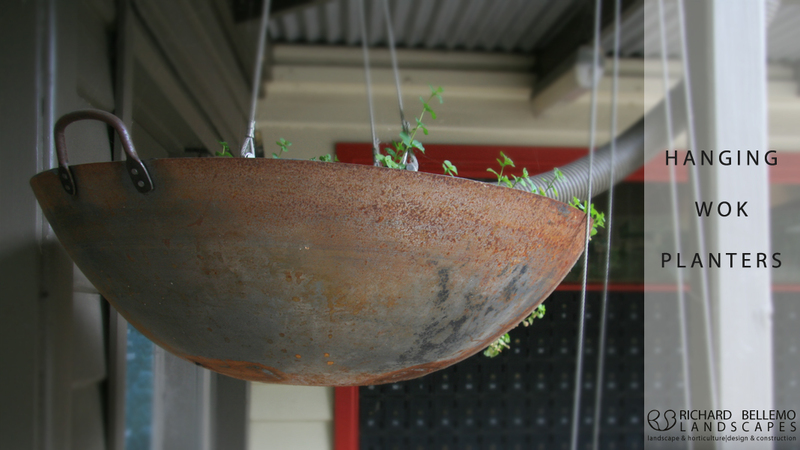 Immediately adjacent to the O’Hanlon Centre are water tanks, screened by a trellis of climbing edible vines. A new bike storage area with both covered and undercover bike racks, forms a pick up and drop off courtyard at the front of the school for students to wait in off Mitchell Street. A new passive play area divides the Basketball Courts and Oval/Running Track. In the centre, is a sandpit island surrounded by swale. Small ponds in the creek bed and hidden courtyards create a great variety of spaces in this area. The Picnic Pond is a passive play space located around the main pond which collects water off the basketball courts and oval through the swale around the ovals perimeter. Around the pond is a picnic deck, a water quality observation deck and tree house. The existing playground to the north west is retained and extended. To the north of the oval, the landscape will be built up in order to create space for a rendered hay bale amphitheatre. The amphitheatre is broken up into 3 seating areas by gullies of planting. In the north eastern corner is a passive play boulder garden with interactive volcano sculpture rocks, which will emit mist when played with. To the south of this area, linked by passive play trails and secrete spots, is the Tunnel Hill, a grassed mound which 2 tunnels cut through. To the north the mound supports a slide and tea-tree tunnel, with additional spaces to find and explore. The Tree House Adventure Playground consists of a series of raised platforms around the existing trees on the western boarder of the school. The platforms vary from 0.2m above ground level in the north, to 2m above ground in the south. The platforms support a range of play equipment slides, rope nets, rope bridges, monkey bars, steppers, tyre climbing wall, reo bar tunnel and swinging log bridge. The Produce Garden contains a permaculture orchard, indigenous plant trail, produce plots and storage sheds. The permaculture orchard is a contained area planted with fruit trees which allows free range chickens to graze underneath. The Indigenous plant trail is an educational garden contains edible and non-edible Australian plants and leads into a more formal produce garden in the south east corner of the school. It consists of 14 produce plots (2 for each year level) and a small gathering space for teachers to assemble the students and communicate ideas. Storage sheds to the north of the produce garden include a propagation house, and provide equipment storage of garden and sporting equipment. RB Landscapes looks forward to implementing our initial design concept with the help of St Patrick’s students, teachers and community, furthering the opportunity of students at St Patrick’s to learn live and play sustainably.